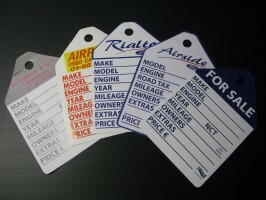 These ever popular, cost effective cards are the perfect SILENT SALESMAN for the busy garage owner.Simply fill in the details with a marker and hang from the rear view mirror. No special pens required. These are available in our standard design from stock for same day dispatch. 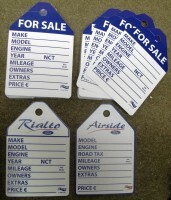 We can also print to order with your own branding and in the colour or colours of your choice from €499 for 1000. A 100% Irish made product for the Irish market. This entry was posted in Accessories, Display Signage, Signs, window signage by PaulSomers. Bookmark the permalink.